The year was 1984. Indira Gandhi was Prime Minister, India were World Champions, and Katrina Kaif was just a month old. It was Onam in Kerala, but this year, it was going to be different. Apart from Mahabali, Keralites also welcomed a little ghost with a drinking problem, named Kuttichathan. He was the Casper-like protagonist of Navodaya Studio’s My Dear Kuttichathan, the big festival release. The posters described the film as ‘India’s First 3D Movie’, a concept quite new to the lay man. Yet once the first set of shows got over, word of mouth was all the promotion the film needed. ‘You need to see it to believe it’, everyone said. The task of mounting this pioneering effort was one of a hundred little miracles. Jijo Punnoose, the film’s director, had just come off the failure of Padayottam (1982), the country’s first indigenously shot 70MM film, featuring Prem Nazir, Lakshmi, Madhu and two up-and-coming actors named Mammootty and Mohanlal. 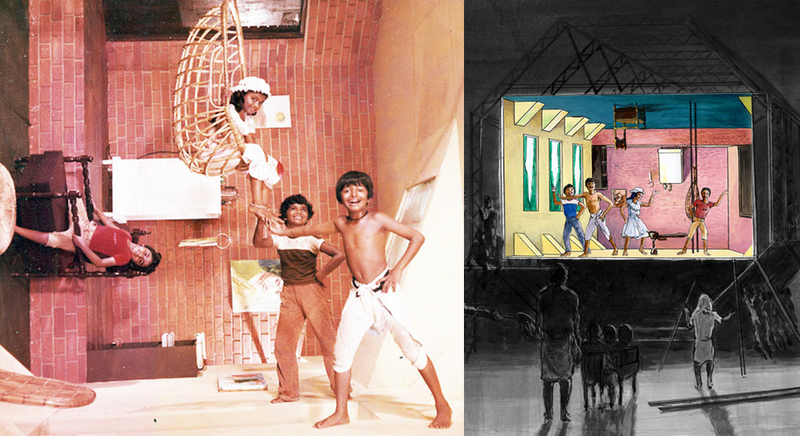 Navodaya, the studio owned by Jijo’s father Appachan, had already made Malayalam’s first cinemascope feature, Thacholi Ambu (1978), and it was expected of Jijo to recreate its magic. A ‘technocrat’ who loved physics, Jijo grew up in a studio in the company of superstars. My Dear Kuttichathan’s writer Raghunath Paleri jokingly describes Jijo as someone who was “born into a cradle made of Arriflex cameras”. But convincing his father to produce the 3D project proved harder than Jijo had thought. He made multiple trips to Burbank, California, to understand the technology. When he returned, he brought home sample reels of American 3D films and painted a silver coat over the screen (needed for 3D) in his preview theatre. 3D glasses in hand, he showed those reels to the team in Navodaya. Appachan was sold and a budget of Rs.40 lakh was allocated. A newer 3D technology called Stereovision had recently been invented. Instead of converging the images from two separate cameras to create the 3D effect, Stereovision’s Chris Condon had come up with 3D lenses that could be fixed on a single camera. But when the cost to borrow the technology was discussed, “they asked for a fee that was enough to buy a small country,” joked Appachan, in a television interview on Asianet in the 90’s. Negotiations followed and the team explained the limitations of a small Indian film. Call it luck, but the Americans agreed for a more affordable fee, with the company deputing their expert David Schmier for the task. He would move to India for the shoot and was going to be the film’s ‘stereogpraher’—the technician who would work with the DOP to ensure multiple images converged perfectly for the 3D effect. Jijo consulted with the giants of the field. He remembers travelling to Bombay to meet Anant Pai, the editor of Amar Chitra Katha, to discuss the idea. Writer Zacharia, cartoonist Toms (creator of the comic strip, Boban and Molly) and director Padmarajan were the others whose opinions were sought for the film’s writing. The failure of Padayottam had forced the Navodaya team to re-think. The budget of a big film was always going to be tough to recover from a small State like Kerala. A 3D film needed to work across borders, with a more universal theme. It had to appeal to children. 3D, even as a concept, was more suited to younger eyes. The idea of a friendly ‘chathan’ was something Jijo had wrestled with for years. Even a few scenes with the ‘3D popping effect’ had been conceptualised, but the script, in its entirety, wasn’t taking form. It was never going to be easy to write a children’s fantasy. Yet, scripting began to take shape only once Raghunath Paleri, a well-published twenty-something writing prodigy, had come on board. He was given bed and boarding, and a salary. Using the inputs of the masters and the scenes Jijo had already planned, Paleri began writing a story about three kids and a ‘kutti chathan’. The writer in Paleri never allowed the film to get diluted for the sake of effects. Of course, there was going to be magic, but nothing that would ‘stick out’ (pun intended). “It’s a script that would have worked even if it was 2D. 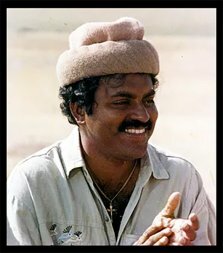 That was how I’d written the film,” Paleri adds, explaining how 3D alone wouldn’t have appealed to one’s emotions, citing the hundreds of kids who cried when Kuttichathan departs in the climax. Ashok Kumar promised Jijo that he would set aside his popular techniques, like excessive highlights, burning back lights, shallow focus and under-lighting. 3D also meant no filters, no masking and no ‘photographic tricks’. There were no monitors to gauge the progress either. Reels had to be couriered to Madras to be processed and it would take at least two days to see if a shot could be used or not. Obviously, we’re talking about special effects at a time when the first ever Macintosh PC had just been launched. Jijo had already planned a few fantastical scenes for the interactions between Kuttichathan and the kids, some of which would also work as an ‘off-the-screen’ 3D scene. But Raghunath Paleri came up with the idea of the Kuttichathan using his magical powers to walk up a wall, and onto the ceiling. When Paleri pitched it to Sheker, he proposed the idea be re-written for a song. The idea sounded simple. The team would build a rotating set, the kind that was made for Stanley Kubrick’s 2001: A Space Odyssey. “If it worked in 2D, why won’t it work in 3D?” Sheker had asked Jijo. 15 minutes after the science was explained, Jijo was convinced. Sheker (promoted to art director) and Jijo decided on a rectangular-shaped rotating room (9 ft high and 14 ft wide) to suit the wider, landscape-like nature of the 3D frame. Jijo then entrusted SILK (Steel Industrial Kerala) with the task of constructing a steel structure on which the room, made of timbre, would go. The octagonal structure, weighing 25 tonnes, was completed in a month’s time. Six men on either side would rotate it to create the illusion that the kids were walking 360 degrees across the room. The song ‘Aalippazham Perukkam’, composed by Illaiyaraaja, was choreographed with the room spinning according to the pace (and beats) of children walking. It took 14 days to shoot the four-minute song. “I remember the excitement on Illaiyaraaja’s face when we watched it together,” remembers Paleri, who had travelled to Madras for the re-recording. “He was one of our first audiences….both the Maestro and I broke into an impromptu dance number on seeing it on the screen.” This was 26 years before the iconic upside-down fight sequence of Inception. The shoot was completed, but another major challenge lay ahead. Navodaya had chosen to distribute the film themselves. The studio’s crew, a small army, was deployed across the State to ensure theatres became 3D ready. A day before release, the team would cancel the evening show of the film that was playing and work overnight. Existing cloth screens were replaced with silver-coated plastic ones. Special lenses were installed in projectors, which then had to be precisely aligned. The studio also manufactured the 3D glasses, which would be cleaned and sterilised after use. The film’s pre-release excitement was such that it was discussed even in Kerala’s Legislative Assembly. But Jijo was impressed with KR’s knowledge of 3D. Despite the steep price, KR decided to buy the film. When he returned to Madras, having bought a ‘dubbed film for a fortune’, he became a joke in the distributor circles. “I wouldn’t have even paid Rs.2 lakh,” a powerful colleague chided. But it wasn’t all smooth sailing. Rumours were being circulated and people blamed the film for spreading conjunctivitis across Tamil Nadu. The film took another hit in the State when its tax-free status was revoked, only for it to be introduced again with advocate P. Chidambaram fighting for the film. 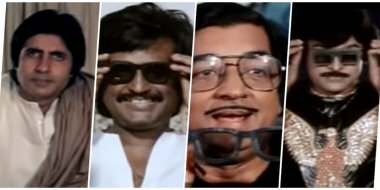 As for the ‘Madras Eye’ rumours, KR says, “I got Rajinikanth himself to shoot a video explaining the use of 3D glasses and how we sterilised them after each use. Similarly, when I bought the Telugu rights, we got Chiranjeevi to shoot the same.” The trick was repeated in the North as well, with Amitabh Bachchan and Jeetendra onboard, vouching for its safety. KR says he recovered more than ten times what he invested in the film. And in Malayalam, My Dear Kuttichathan remains one of the highest-grossing films of all time. By the end of its run, the film had totaled 85,000 screenings around the world, with a staggering 43 million 3D glasses being used. Kurup Thiruvizha, Navodaya’s projection expert, had travelled so much for the screenings that he’d won the Indian Airlines Award for the most travelled Indian. The film’s success was such that it spurred three more re-releases, including Chotta Chetan, a Hindi DTS version in 1998. It also started India’s 3D craze with many trying to imitate its success using inferior substitutes like the ArriVision 3D camera. Vijayakanth’s Annai Bhoomi 3D, the Tamil-Telugu bilingual Jai Vedalam, K. Simon’s Thanga Mama 3D, A. Vincent’s Pournami Raavil and the Jackie Shroff-starrer Shiva Ka Insaaf followed suit, but none of them were able to make an impact.